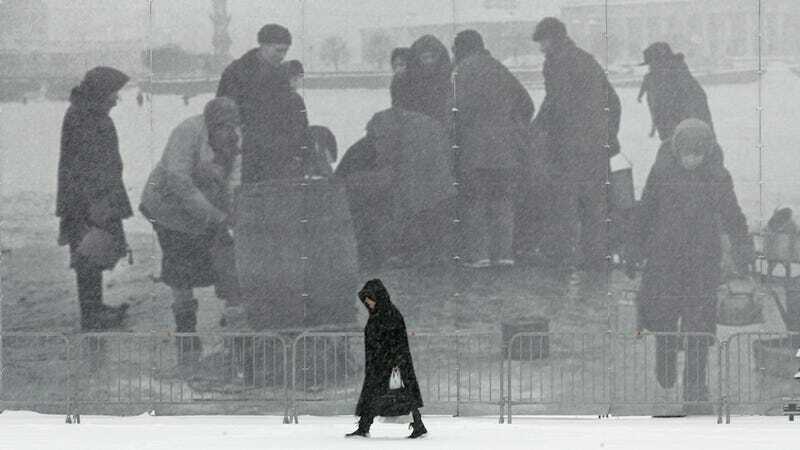 Today is the 71st anniversary of the end of the years-long siege of Leningrad, one of many horrible chapters from the book of horrors that was World War II. And some Russian Facebook diet blogger thought encouraging everyone to diet like the Nazis had just cut their food supplies would be a good commemoration. Many of his countrymen did not agree. BuzzFeed talked to Alexander Siry, proprietor of the Facebook group Get Thin Like Me, where he shares tips gleaned from his own 250-pound weight-loss journey. But he poked a hornet's nest when he proposed the Leningrad blockade diet, like so: "You won't only get a jump start on your figure and health — you'll also get a charge from the energy of a unified team and recall the triumph of Leningraders during the fascist Blockade." According to BuzzFeed: "The particularly committed are encouraged to make their own 'blockade bread' with offal, grist, wood shavings, and cat food." (The Facebook group has been taken down, but the Moscow Times backs BuzzFeed up, saying the recipe included "ingredients now only found at pet stores.") Plain brown bread is also acceptable, but only 400 grams worth, though dudes are allowed to replace 100 grams of evening bread with vodka. So Siry's recommendation was not received well. Not one bit! Cue Russian-language viral shitstorm and angry Facebook comments. But when BuzzFeed reached him, Siry still didn't seem to see what had everyone so worked up: "It's all been blown out of proportion," he said, adding that, "I just asked my friends who are trying to lose weight but have problems with their motivation to just drink water and eat a limited amount of bread," and he'd seen other promos with "much more dubious connections to the blockade." The online outrage cycle: It transcends language and culture. Image of 65th anniversary commemoration of the siege via AP.